This time of year is when I'm all about salmon! 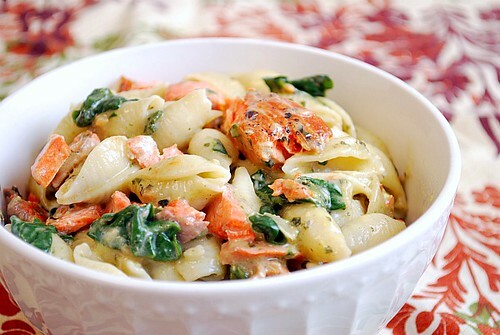 It's prime salmon season and one of my favorite salmon dishes is this Salmon & Spinach Pesto Pasta. 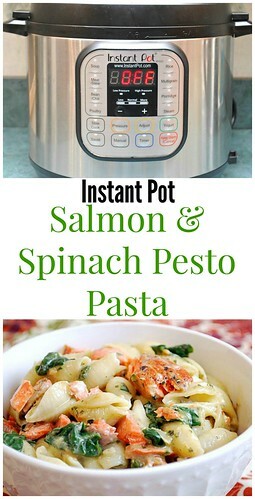 The creamy spinach pesto sauce compliments the fresh salmon ever so delicately and makes for a colorful and flavorful pasta dish. I absolutely love salmon and pesto together. This dish incorporates a twist on the traditional pesto by using spinach instead of basil. Once the pesto is made, it's added to pasta with heavy cream, spinach and Parmesan cheese for a luscious sauce. Open up your IP when the pin has dropped (allow a few minutes for this to happen). The IP will automatically default to the WARM mode. You'll notice no draining is necessary; the water will be absorbed by the pasta. Press SAUTE on the IP; add smoked salmon, heavy cream, lemon zest, lemon juice, prepared spinach pesto, the reserved spinach, remaining Parmesan and stir. Cook until cheese melts through and spinach wilts down. Serve with freshly grated Parmesan if desired.